Clover root weevil (CRW), Sitona lepidus, was first discovered in 1996 in Waikato and Auckland and has now spread as far as Southland. The adult weevil feeds on clover leaves. Although present all year round it is most abundant in summer. The larvae are most damaging. Although present throughout the year, they are most abundant from late autumn to early spring. If CRW populations are high and pasture stressed, this can result in total clover loss in pastures. In 2006, a parasitoid wasp was released in NZ to help suppress CRW populations. The most obvious sign of CRW is the distinctive notching on clover leaves caused by adult feeding. If notching is observed, further evidence of CRW can be found by digging up some clover plants to look for larvae in the top 5cm of soil near clover roots. The adult stage of CRW feeds on clover leaves and the larval stages feed on clover roots. The picture on the right shows severe adult feeding. You may see fewer notches, so check for other signs of damage too. Young larvae tend to feed in clover root nodules (which capture atmospheric nitrogen), while bigger larvae will feed anywhere on the root system. This picture shows young larvae feeding damage on clover nodule. Older larvae damage clover stolons. Clover roots capture nitrogen from the atmosphere. Livestock eat the clover (along with the nitrogen it has captured), then return the nitrogen to the pasture in their urine and dung. This nitrogen then becomes available to increase the growth of other pasture plants such as ryegrass. Clover therefore provides 'free' nitrogen fertiliser. When CRW feeds on clover roots, they reduce the amount of nitrogen that can be provided by clover, and this must be supplemented with nitrogen fertiliser to maintain productivity. In the North Island, CRW damage is particularly significant in dairy pastures. North Island dairy farmers have reported substantial loss of productivity due to CRW, with reductions in nitrogen fixation by clover of 50% to 100%. The amount of nitrogen fertiliser needed to compensate for CRW varies with soil type, fertility and climate. Clover is also a high quality food for livestock. CRW larvae and adults reduce the clover's growth rate and survival through the physical damage they cause to the roots and leaves. Thus, the amount of high quality food available to livestock is reduced. In 2006 AgResearch introduced a small parasitic wasp (Microctonus aethiopoides) as a biological control agent against clover root weevil. 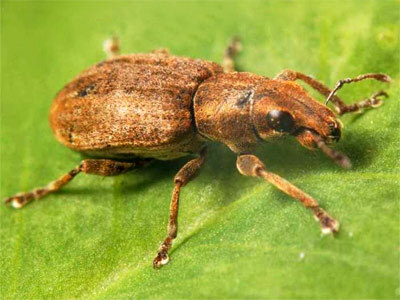 It lays an egg inside the adult CRW, which immediately stops the weevil from being reproductive. After a major release programme by AgResearch with support from DairyNZ, this biological control agent is now present in most areas of the North and South Islands (see www.agresearch.co.nz/crw for the latest map on its known locations). The wasp is also spreading naturally from release points at the rate of 15-20 km per year. Once established the wasp may take 2-4 years to effectively control CRW populations and for clover to return to pastures. It will not eliminate damage altogether and there will be cycles when CRW populations increase again before the parasitoid can bring it under control.